We first prepared this dish as a last-minute addition to a holiday appetizer platter. Our company was on their way when we realized the first course consisted of mostly cured meats and cheeses. The few sparse fruits and vegetables were more decorative than substantive. A frantic scavenger hunt around the kitchen yielded limited ingredients. The clock was ticking. It was time to get to work. Fifteen minutes later, the doorbell rang. A small ramekin full of our attempt along with some baguette toasts were placed on the table just as our guests dug in. I went back to the kitchen to prepare the rest of the meal. When the first couse was cleared, plenty of Sopresatta and Grana Padano were left but the ramekin returned to the kitchen empty. 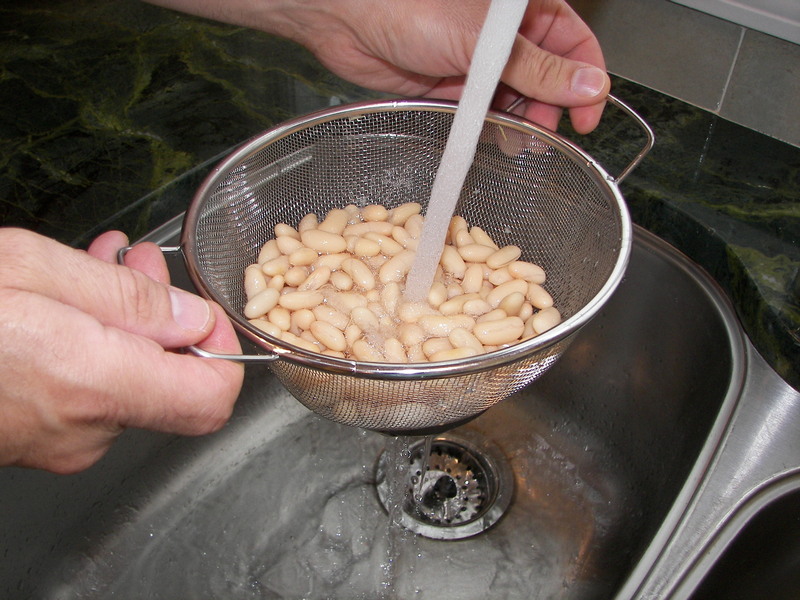 Drain the can of beans into a colander and rinse thoroughly in cold water. Shake colander to drain off excess water. Let stand in sink a few minutes to allow excess water to drip away. Run the beans through a food mill fixed with the smallest size disk. 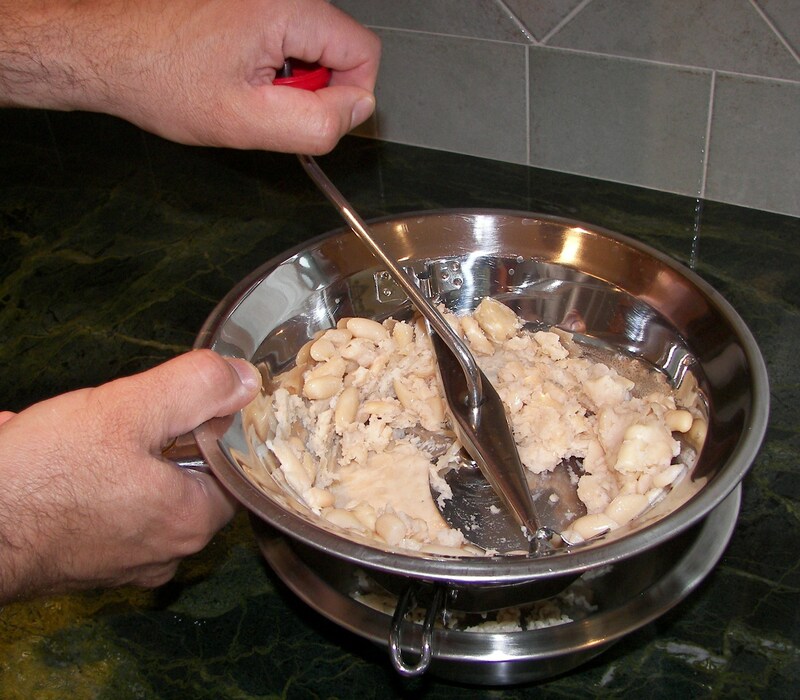 Catch bean mash in an appropriate size bowl. 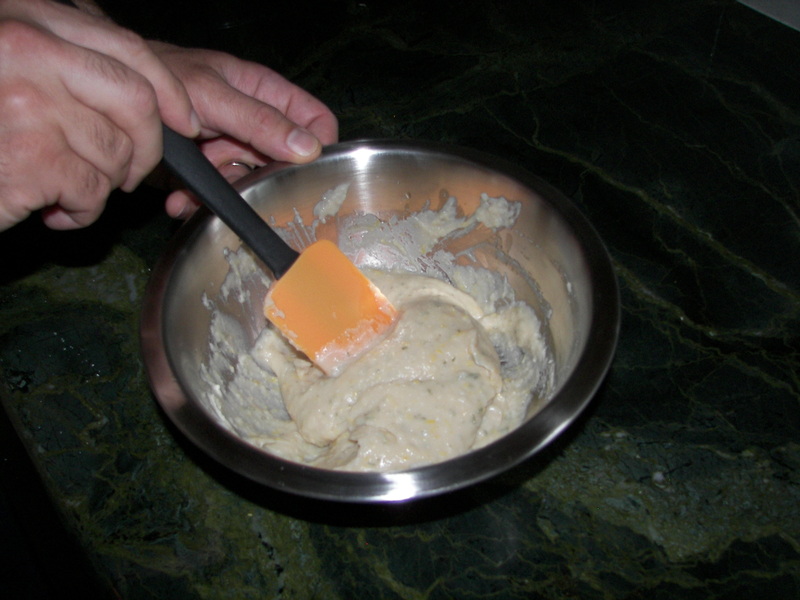 Note: It is easier to control the texture oil of the dip by using a food mill instead of a food processor. The food processor purees the bean skins into the pulp and whips the texture into mush. 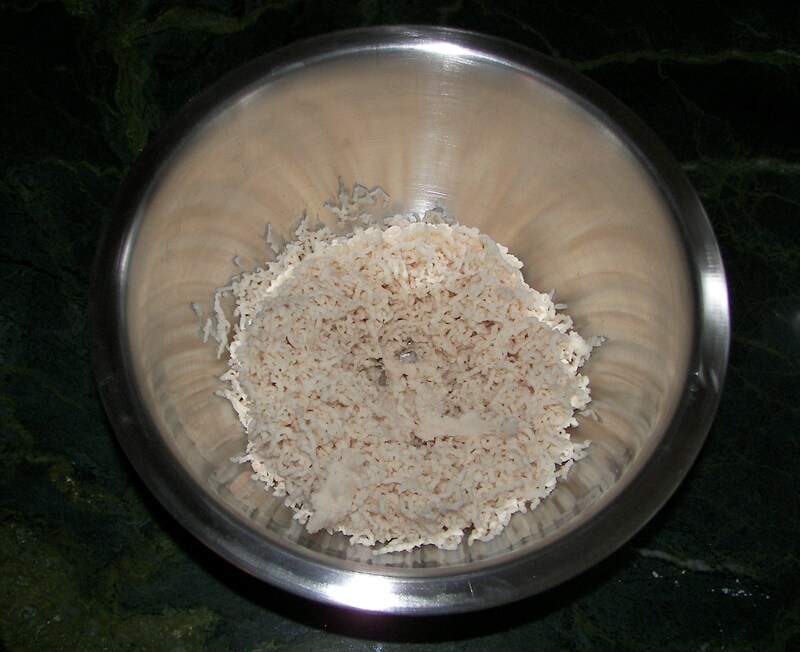 The food mill removes the skins and creates a fluffy texture. Crush the Garlic clove with the flat side of a knife. Sprinkle kosher salt on top. Run the blade of the knife through it until finely minced then mash with flat edge until a paste is formed. 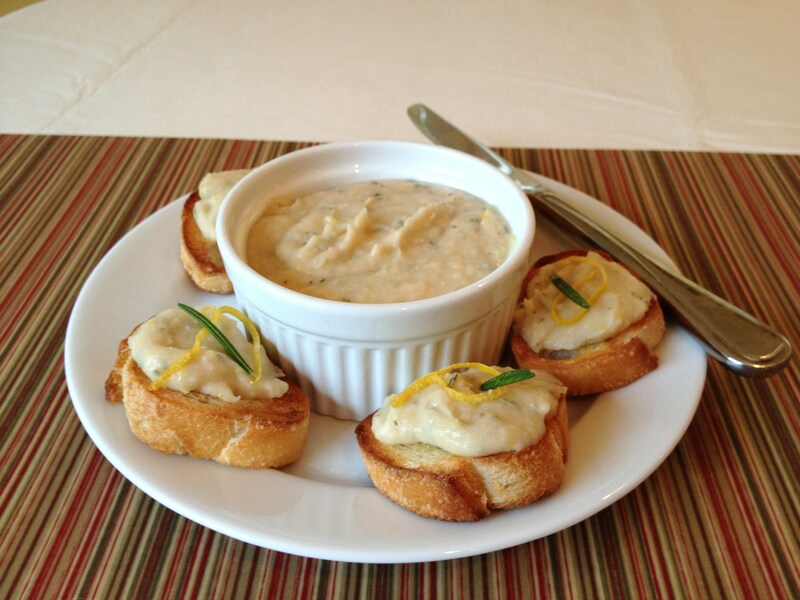 Fold in garlic paste, lemon zest, rosemary, and lemon juice into the bean puree. 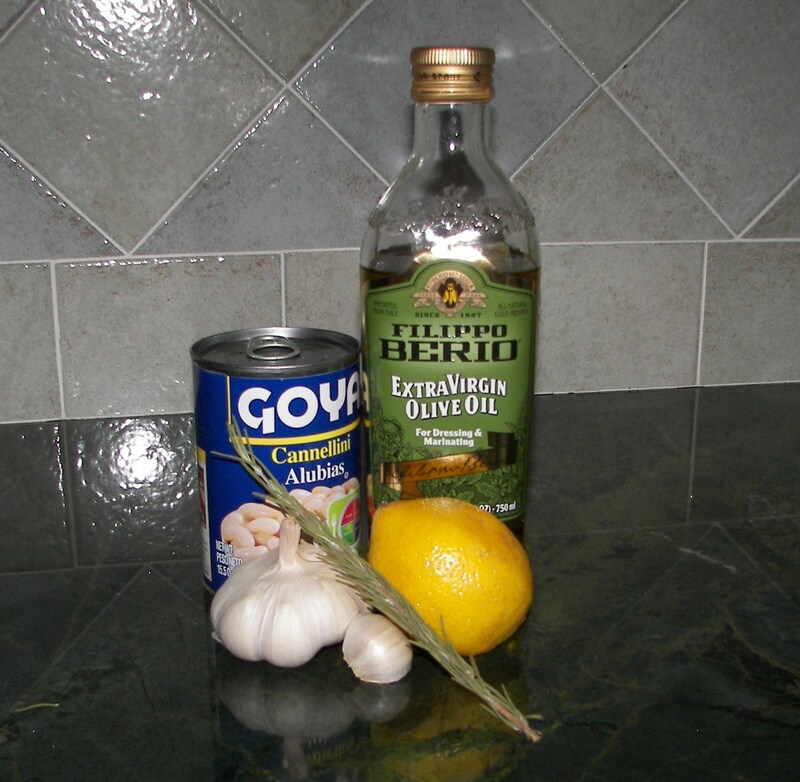 Add enough Olive Oil until puree is smooth and the acidity of the lemon juice and zest is balanced. Note: The key to this dish is balancing the acidity from the lemon zest and juice with just the right amount of the olive oil. Add both intermittently and taste as you go. This will enable you to adjust the spread according to your tastes. The Bean Spread can be consumed immediately, but it is much better when allowed to rest first. The flavors come together as it sits. Preheat oven to 400 degrees. Cut the baguette into 1 inch thick sliced. Brush each side with olive oil. Toast bread in oven until each side is brown. Let cool. Spread a generous portion of bean dip on top.